Sticky brakes? Heating not working? Water leaking? No lights? 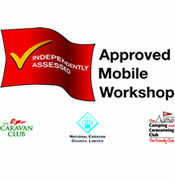 We're just a call away for all your caravan repair needs. CMS Mobile will repair your leisure vehicle at home, in storage, or on site. Our engineers are manufacturer trained on a wide variety of caravan appliances as well as the bodywork and chassis. CMS Mobile carry’s a large selection of spare parts to be able to fix most problems. Unfortunately we can't stock all parts, and in some cases we will need to order parts to complete the repair. Our repairs are priced on a “job basis” taking in to account parts, time and travel. We will always quote before any work is carried out.